Rose of Arden: The transport archive. I don't know if you have ever had a look at the Canal Archive on the canals section of the Transport Archive. The Timeline has many old canal photographs dating back to the 1880's. here are a few from the Manchester Ship Canal opening. 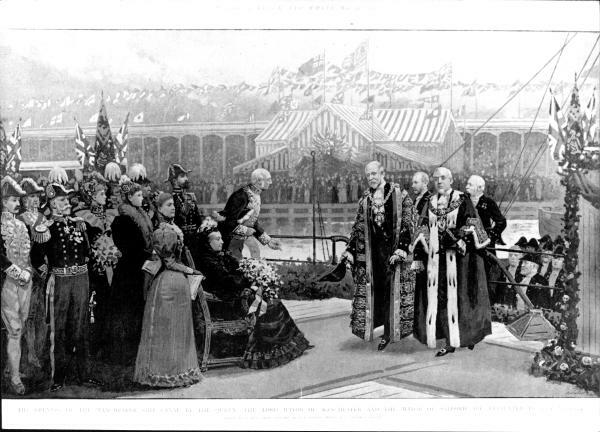 Queen Victoria's visit in May 1894 marked the official opening of the Manchester Ship Canal. An earlier opening had taken place on New Year's Day of the same year, in which a procession of vessels had sailed the length of the Canal. Samuel Platt was one of the directors of the Manchester Ship Canal Company. 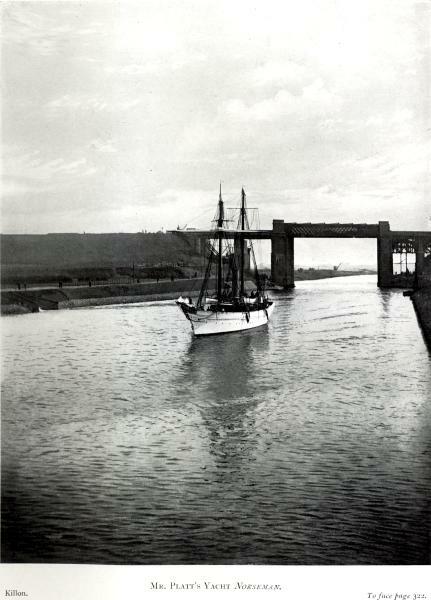 His steam yacht 'Norseman', carrying his fellow directors, led a procession of vessels along the Ship Canal on its opening on New Year's Day, 1894. 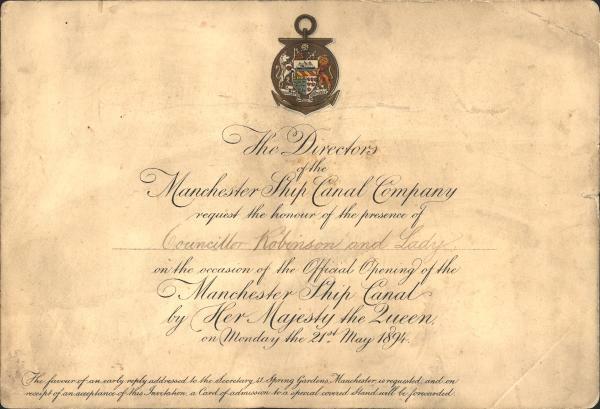 This invitation was issued to a 'Councillor Robinson and Lady' inviting them to the official opening of the Manchester Ship Canal by Queen Victoria in May 1894. The Queen's visit marked the official opening and her visit was met with great celebration. 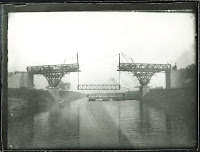 The construction of the Manchester Ship Canal resulted in the need to build high level bridges which spanned the waterway. Warburton High Level Bridge was constructed to allow pedestrians and other users to cross the Canal. 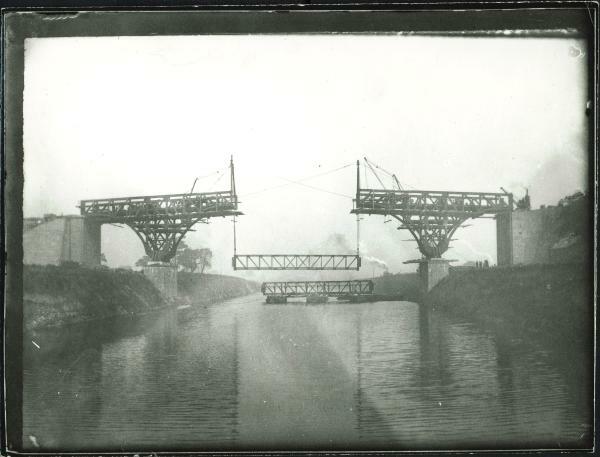 Here the centre girders are being lifted into place from Manchester Ship Canal barges. They were raised by large winches from the partially assembled bridge above. Over 16,000 men and boys worked on the construction of the canal. Known as navvies, they worked in all weathers, often in difficult conditions, as shown here. 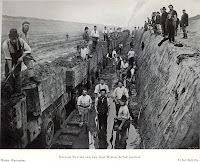 This well known image also shows the use of a temporary railway network, which was laid along the Canal route, carrying men and material around the Works. Dredging was an important activity in the Manchester Ship Canal's construction, with dredgers removing material from the bottom of the water filled sections. 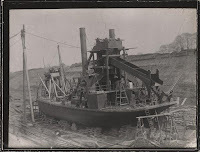 The dredger 'Bollin' was produced by Fleming and Fergusson of Paisley, and was constructed on site in the canal cutting ready for action. This is just a small sample of the thousands of photographs and documents relating to canals that can be found on-line on the Transport Archive.